Thursday, Nov. 12 – The Tabernacle – Atlanta, Ga.
Wednesday, Nov. 18 – The Emporium – Patchogue, N.Y.
Thursday, Nov. 19 – Lowell Memorial Auditorium – Boston, Mass. Friday, Nov. 20 – Terminal 5- New York, N.Y.
Thursday, Dec. 3 – Comerica Theatre – Phoenix, Ariz. Within a few short years of moving to Nashville, country music maverick Chase Rice has already built a loyal fan base across the country through his energetic live shows and gained the attention of industry professionals with his edgy, eclectic sound. Rice’s new album, Ignite the Night, was released on Columbia Nashville/Dack Janiels Records and debuted at No. 1 on Billboard’s Top Country Albums and No. 3 on the all-genre chart. With a Platinum-certified, Top 5 hit already under his belt with lead single “Ready Set Roll” and new single “Gonna Wanna Tonight” in the Top 20 and climbing at country radio, Rice continues to perform headlining dates in addition to touring with Kenny Chesney on The Big Revival Tour. 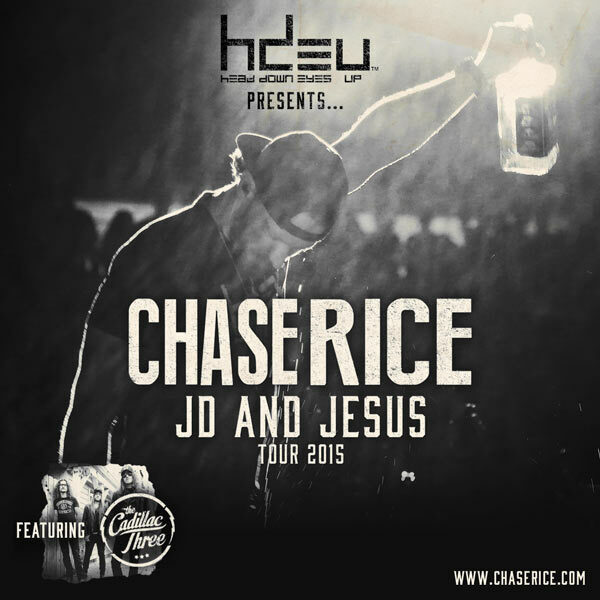 For more information, visit www.chaserice.com or follow on Twitter @ChaseRiceMusic and www.Facebook.com/ChaseRiceMusic. THE CADILLAC THREE is rapidly becoming known for their high-energy shows, gritty musical instincts and buzz-worthy raw sound. With opening slots on Superstar tours and sold-out stops across Europe, the trio of Nashville natives were named the UK Classic Rock Roll of Honour Awards Best New Band and one of the 10 New Artists You Need to Know by Rolling Stone Country. The talents of Jaren Johnston (Guitar & Lead Vocals), Kelby Ray (Bass Steel Guitar, Dobro, Acoustic & Vocals) and Neil Mason (Drums, Percussion & Vocals) extend into songwriting, garnering #1 hits for Keith Urban, Tim McGraw and Jake Owen, among others. Lauded by Rolling Stone, TC3’s latest offering “White Lightning” is currently climbing up the charts. For tour dates and more, visit thecadillacthree.com.